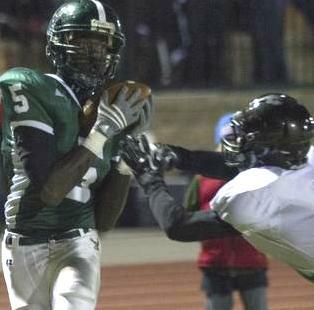 Free State's Khadre Lane. Lawrence Journal World. It took six weeks of play, but there are is no longer an undefeated team left in the Sunflower League. 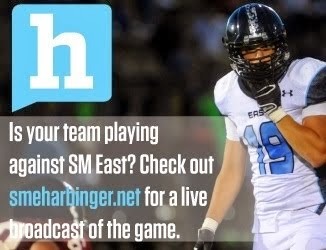 Not after Free State dominated SM East in all facets of their game on Friday night. The Firebirds got on the scoreboard first when Kyle McFarland hit Tye Hughes on 21-yard touchdown pass late in the first quarter to go up 7-0. The score came after Joe Dineen picked off a Jordan Darling pass early in the quarter. In the second quarter SM East was faced with a fourth down deep in their own territory. Connor Rellihan was unable to get the punt off and fumbled the ball, which Dineen scooped out of the air and scored a touchdown on. Free State led 14-0. Later on with 4:27 left in the second quarter Demarko Bobo picked off a Darling pass and took it back 29-yards for a touchdown to give Free State a 21-0 lead. The final score of the game came early in the fourth quarter when McFarland hit Khadre Lane on a 36-yard touchdown pass to give the Firebirds a 28-0 lead. The most telling stat of the game: SM East's quarterback Darling completed just nine of 28 passes for 75 yards, while tossing three interceptions. The Chesty Lions kept rolling, picking up their fifth win in a row, this time over SM South who fell to 3-3. Lawrence got on the board in the first quarter when Brad Strauss rolled out of the pocket and hit Erick Mayo on a swing pass which he took 38-yards for a touchdown. SM South answered with a long drive that was capped off when Gabe Guild scored on a run from four yards out, to pull the game to 8-7. Lawrence's next score came on a Simone-esque play from Strauss. After driving into SM South territory, Strauss dropped back, avoided a few defenders, rolled out to his left and stiff armed a defender, then hit a wide open Mayo in the front of the endzone for a 27-yard touchdown strike. Lawrence jumped to a 16-7 lead with a successful two-point conversion. The game held in check until the fourth quarter when Strauss hit Drake Hofer on a 14-yard touchdown pass to go up 24-7. Late in the fourth quarter Lawrence scored once more when Jordan Brown recovered a fumble and returned it for a touchdown to go up 32-7. It took little time for SM West to establish themselves, but it was their passing attack--not their rushing game--that stood out. The Vikings first offensive play of the game was a 49-yard pass completion, and shortly thereafter quarterback AJ Verdini connected with Andre Maloney on a 12-yard touchdown pass. Leavenworth countered with a field goal from Judson Cole, but SM West answered back with three touchdowns. A four-yard run from Brett Sterbach, then a 12-yard run from Sterbach, then a seven-yard pass from Verdini to Maloney. The scores gave SM West a 28-3 halftime lead. In the third quarter Leavenworth added another Cole field goal and a touchdown on a 29-yard pass from Cole to Isaiah Ross. But SM West added a touchdown run from one yard out from Sterbach to build the lead to 35-13. In the fourth quarter SM West added a field goal from Joey Reed while Leavenworth's Landry Hodges connected with Ross on a 16-yard touchdown pass. The defending 6A champion Falcons got back on track after losses in back-to-back weeks. Olathe South opened scoring with a 22-yard run from Russell White. Next, quarterback Frank Seurer found Matt Elliott on two touchdown passes, the first from 18 yards and the second from 10. At the half Olathe South led 21-0. In the third quarter Chase Hanson added a five-yard touchdown run to make things 28-0. The final score came when Thomas McCue scored on a 23-yard run in the fourth quarter. Olathe East came out with a bully mentality and came away with their second win of the season. They capped off their first drive of the game with a six-yard touchdown run from Ryan Woodson to go up 6-0. Olathe North kept things close with 20-yard field goal from Jorge Rivera before the half to make things 6-3. On the first drive of the third quarter Olathe East put together a seven play, 62-yard drive that was capped off with a 27-yard run from Hayden Frazier. A successful two-point conversion put the Hawks up 14-3, a score that held through the rest of the game. Olathe Northwest continued to build up momentum, this time on a Thursday night victory over SM North. No box score was provided, but Olathe Northwest led 14-7 at halftime and was able to come up with a big second half. Olathe Northwest quarterback Holdyn Halperin passed for 151 yards, and Alex Pruss added 128 rushing yards on 14 carries. SM North's Caleb Denman had a big first half rushing for 155 yards and a touchdown on eight carries, but the momentum wasn't carried over to the second half.